How many coins contain clouds? 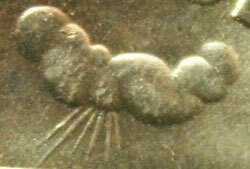 This coin challenge shows a cumulus cloud with rays projecting from the bottom of the cloud. The main design for the coin represents one of the oldest religious buildings in the US that is still standing as originally built. The building is over 300 years old. The nearby burial ground predates the old building by 60 years. Click on the Coin Challenge - Cloud Answer if you are ready to verify your choice for the coin!